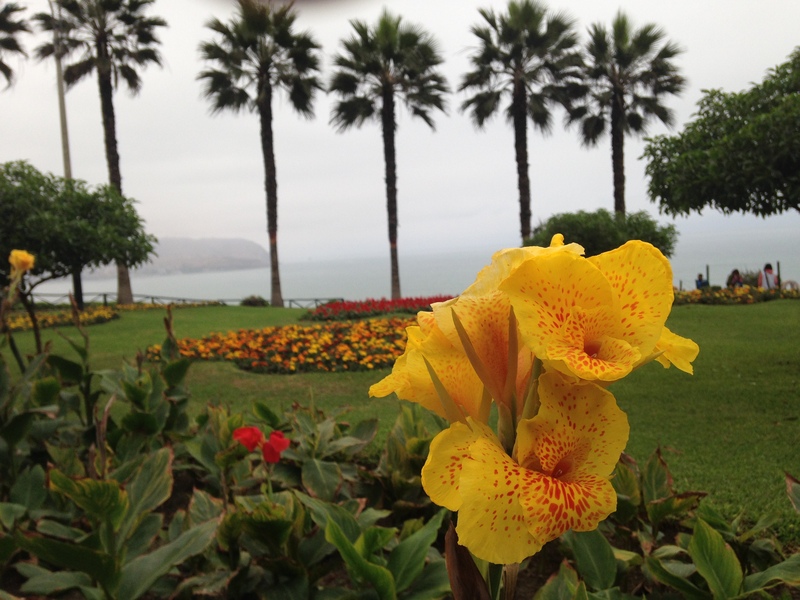 Last week we returned from an 11-day trip to Peru. The impetus for the trip was to hike the famed Inca Trail to Machu Picchu, something we’d been talking about doing since we were in our twenties. It was then one of those distant, maybe-someday, sort of things, a long-term bucket list item that we shelved once we had children and the notion of traveling 4,000 miles away to hike 27 miles without them would have raised some eyebrows. Then, late last year, my friend Heather reintroduced the idea. Turns out we aren’t getting any younger, and the strenuous nature of the trek made the feasibility of postponing this adventure much longer a little sketchy. I mean, here at midlife we’re still reasonably fit and healthy, but you never know what’s right around the corner. So we took a chance on ourselves, put down a wad of cash on the trip of our dreams, broke the news to our children (who were less than thrilled to be left behind), and started working out the logistics. Seven months later, we were winging our way to Lima in coach, fingers crossed, trusting that we’d return home safely to children who discovered they could survive without us. I want to share something of our adventures, so I am going to spend a week or two writing up some memories of the trip. Thanks for indulging me. 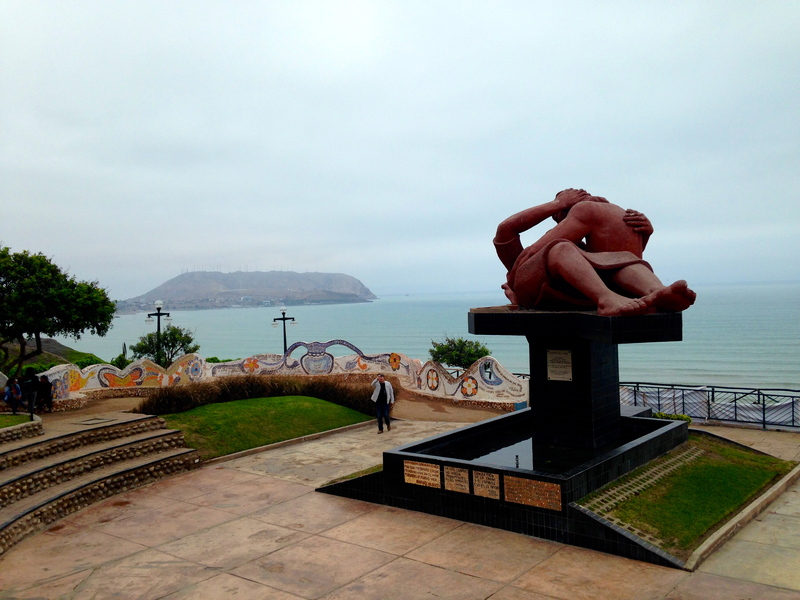 After a decent night’s rest at the Tierra Viva Hotel in the Miraflores district of Lima, we were anxious to explore. First stop, sadly enough, was to Starbucks to access reliable, free wifi and to satisfy an intellectual curiosity about the international cost of a Starbucks vanilla latte. (The latte was comparably priced to our local haunt…approximately $4.33 for a venti.) With no desire to sit after a long travel day, headed out armed with a map and a little blood in our caffeinestreams. 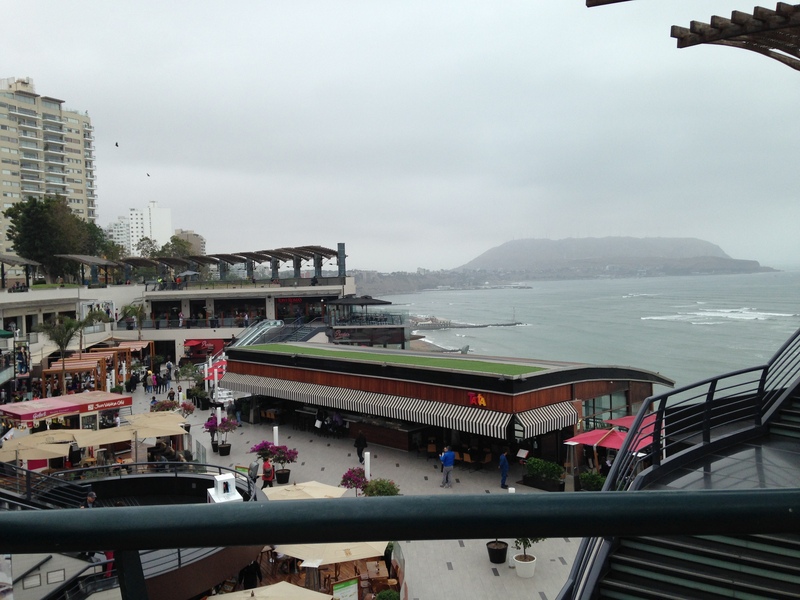 We walked to Larcomar, an upscale shopping mall built into the sea cliffs in Miraflores and listed as a must-see attraction in the area. While its location and architecture are worth noting, at the end of the day it’s just another mall with a Pinkberry and a Gap. We were hungry, though, and decided to eat lunch there at a local chain that specializes in pollo a la brasa (roasted chicken). Not eager to encounter stomach sickness before our long hike, we eschewed the salad we might have had at home and filled ourselves with chicken, fries, and Cusqueña, the local lager. With full bellies, we headed away from the coast and walked blocks back into town in search of something that felt a bit more unique. We found it at Parque Kennedy, which is home to dozens of feral cats who have been adopted by the city’s residents. Local citizens set out bowls of water and food for them under trees in the shade. The park was designed with built-in seating where people can relax with their lunches and smartphones (free wifi in the park too, who knew?). Once you settle into a seat, a cat is likely to find its way into your lap for a warm, cozy nap. I found this local custom perfectly charming. The cats seem to be well-cared for and not at all mangy or unclean. We even saw one with stitches in its leg, which leads me to believe that they are getting medical attention when necessary too. 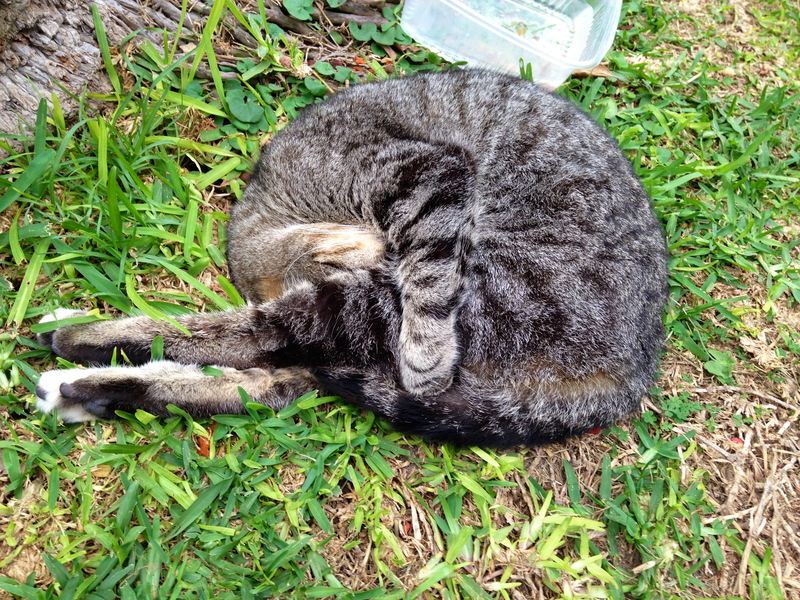 The park serves as a de facto library system for cats. You stop by, borrow one for a while, and return it when you’re ready to leave. I was missing my dog and wanting some animal attention, so I sat down near a cat who was not spoken for and waited to see what he would do. After sizing me up for a minute, he decided I was acceptable and crawled into my lap. There he napped for about 20 minutes while I petted him. Made my day. Pet fix achieved, we returned to our hotel to mull dinner options. We landed at Panchita, a large restaurant that was more populated with locals than gringos. There were no menus in English, which boded well for an authentic experience. We attempted to conjure up any Spanish-language remnants from high school for about fifteen minutes before our waiter realized we were out of our element and sent over another waiter to offer suggestions in English. Good man! 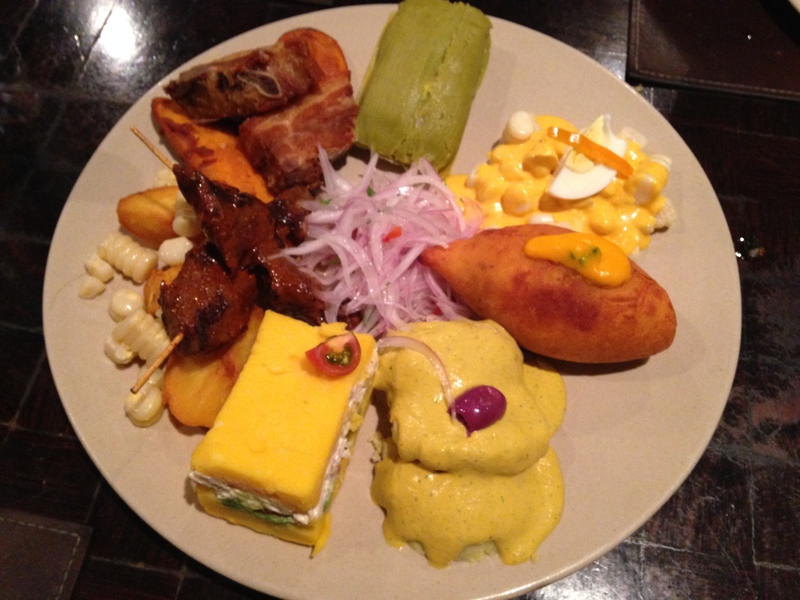 Eager to try some real Peruvian food, we ordered a sampler platter and four different entrees. There was not a thing we tried that we didn’t enjoy. We tried Peruvian Anticuchos (beef hearts), papa relleña (fried, stuffed potatoes), causa (a layered dish with mashed potatoes, meat, and avocado), and some local giant corn covered with huancaina sauce. Steve ordered the lomo saltado (grilled beef with peppers and onions) and I had tamales and arroz verde. For dessert we shared some picarones (Peruvian donuts). You could stick a fork in us because we were so done. Not exactly sure how we ate that much or how we managed to waddle back to our hotel. By far the most unexpected thing about Peru was how wonderful the food was. Everywhere we went we found new delicacies to enjoy. The Peruvians take great pride in their cuisine, and it shows in the flavor and presentation of every single dish. We thought we’d head to South America and lose weight. Tell that to my now tight pants. After transferring our bags to the hotel where we would meet our tour group later, we walked back up one of the main streets in Miraflores to look for our next great food adventure. We apparently planned to eat our way through Peru. We stopped into a sandwich place and somehow lunch became more dessert than anything else. Tres Leches cake and churros dipped in chocolate, anyone? Desperately seeking exercise, we walked toward the sea cliffs to stroll the boardwalk that connects Larcomar to several local parks. 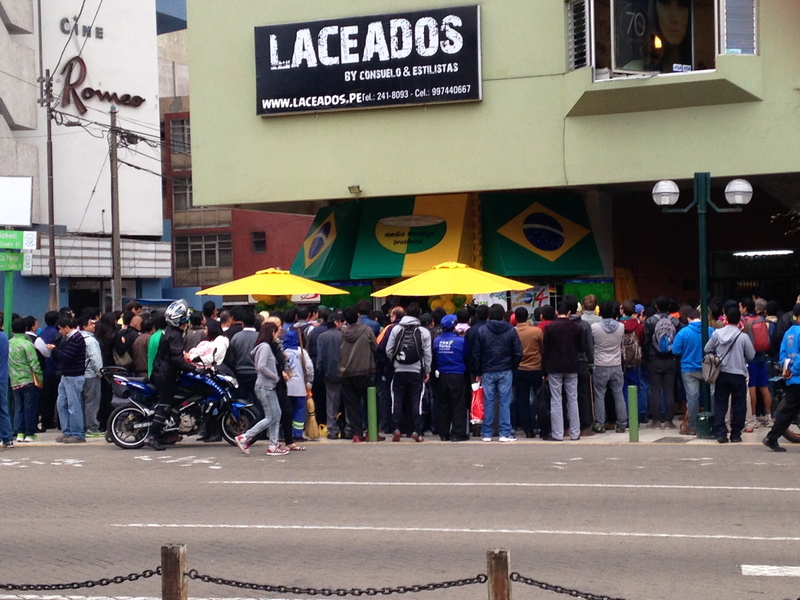 Along the way we passed a restaurant where Brazilians had gathered to watch their World Cup game against Germany. It was not pretty. My blonde hair made me feel like sore thumb for some reason. We strolled toward the boardwalk, which in truth is more of a sidewalk than a boardwalk, with the intention of making our way through several parks. This part of Miraflores is called the Costa Verde because despite Lima’s status as a coastal, desert town, things actually grow green here. There were tons of flowers and bushes, along with cactus, green grass, and palm trees. It was hard to believe Lima was in the midst of winter because it didn’t seem like winter to these northerners. It was never under 60 degrees Fahrenheit, and most daytime temps were closer to 70. While the locals walked in boots, coats, and scarves, we strolled in light jackets. It was chilly, but not a Colorado winter by a long shot. I had read that winter in Lima was grey and dry, and that was no exaggeration. It was continually overcast, but rainless, and still quite tolerable. Our walk down the Malécon landed us at El Parque Del Amor. There resides a sculpture by Victor Delfin called El Beso (The Kiss). Surrounding the sculpture are walls filled with bright mosaics. There are more built in benches where lovers can hang out and enjoy the sculpture…or not. A local tour guide told us that every year they hold a kissing contest beneath the sculpture. The longest kiss was over 9 hours. That’s more dedication than I have. I honestly can’t think of anything I’d like to do for 9 hours straight. Not a thing. Further down the boardwalk we came across the place where paragliders launch themselves via updrafts over the cliffs. We watched them for a while and, for a few seconds there, I almost thought it would be worth the $60 flight cost. Then I decided that since my main goal in traveling to Peru was to hike the Inca Trail I might be better off saving my flight for another bat time, another bat channel. No need to risk breaking my ankle landing from paragliding the day before our trek to Cusco, the Sacred Valley of the Incas, the Inca Trail, and finally Machu Picchu. We walked back to our hotel to meet our G Adventures representative and get the skinny on our flight to Cusco in the morning. We were finally on our way. Just reading your post made me so full!!! 😉 Oh and I would have loved the cat park!